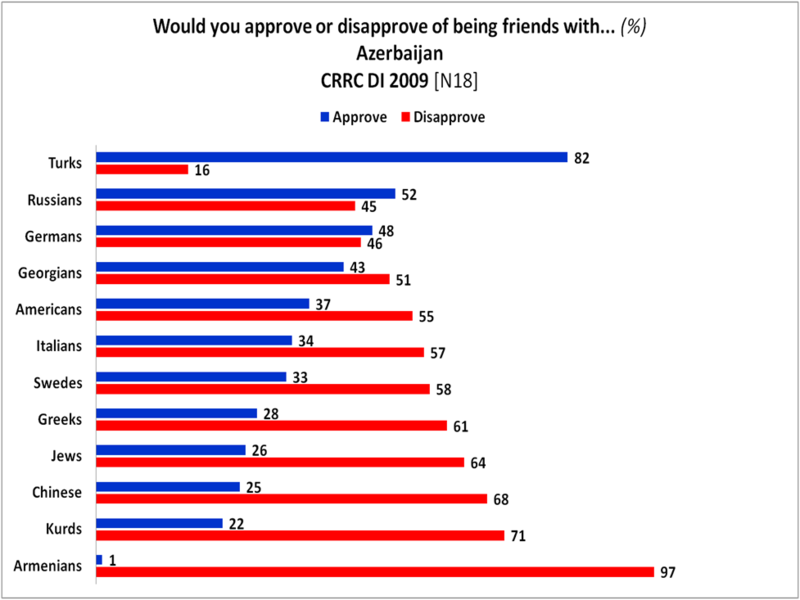 Azerbaijan is by far the most disapproving of friendship with other ethnicities. Most Azerbaijanis disapprove of interethnic friendship with the exception of 82% approving of friendship with Turks, and 52% favoring friendship with Russians. While unsurprising within the context of protracted strife between Armenia and Azerbaijan, a staggering 97% of Azerbaijanis disapprove of friendship with Armenians. But this also gives us an opportunity to look at the conditions within and outside of Azerbaijan. One of the most common sentiments I hear from my Azeri friends and acquaintances is that once Armenians and Azerbaijanis are outside of their respective countries, say, in the US or Russia or even in the northerly neighbor, Georgia, the animosity between Azeris and Armenians dissipates. And I’ve talked with numerous people who say that they used to have Armenian neighbors during the Soviet period either here in Azerbaijan or in other republics of the Soviet Union, lamenting that they haven’t seen or heard from these people since that time. I think there are probably a couple of things that don’t really square here in the data described by the CRRC. First, I’m assuming that the sample for each country was taken within that country, itself. I can’t speak for Armenia or Georgia, but even our new US Ambassador has noted that negative propaganda here in Azerbaijan regarding neighbors immediately west is prevalent and strong. Escaping this environment probably relieves some of the pressure to maintain that negative attitude. The people here probably fear some sort of reprisal for expressing any interest in the other side, as well as being enveloped in the propaganda. Second, and probably more importantly, is to realize that Azerbaijan is a country that many people want to escape from, in general. I can’t go a day without someone asking me when I’m going to take them to America. Many people talk about the possibility of living in Russia or Ukraine or European countries. Or studying abroad for high school, university, or Master’s studies. I think if you surveyed this group of people, people who “got out” or ones who are looking to do so, you would likely find much different responses to the questions querying approval or disapproval of interethnic friendships. The results of the CRRC survey may not change dramatically, but it seems to me that a large portion of the population open to idea of friendships with other ethnicities is probably no longer in the country, off pursuing those friendships. With those two caveats applied, however, that still doesn’t change how open Azerbaijanis are to foreigners. As one of those pesky foreigners, myself, I can attest to that general suspicion that hangs in the air as people notice my presence. While Azerbaijanis are certainly hospitable and generous to guests, that is a much different quality than the openness described above. My feeling is that Azeris would be more open minded to inter-cultural friendship if they had a chance to meet with people outside of the country. I undertook my first independent travel during the Cold War and spent a great time in Yugoslavia where I met young Russians [and drank large amounts of alcohol with them]for the first time. That helped me to overcome the suspicions and distrust we were fed by the British government of the time. Actually, it is about the percentage of people from a variety of countries who see the US in a favourable or unfavourable light. Unfortunately Azerbaijan isn’t mentioned but it is interesting to not that more than 60% of people from Turkey consider the US in an unfavourable light… Interestingly, so do 15% of American citizens! And the US is holding strong with an 11% unfavourable rating against itself. Impressive.